Remove extraneous sounds from your recording (mouth noises, pops, keyboard clicks, etc.). Modify the pace of narration, if necessary. When appropriate, portions of the recording that are edited out are replaced with clean room tone. Listen to the audio while reading the manuscript to ensure they match exactly. Mark down any errors (misreads, mispronunciations, or noises you can’t edit out) to a QC sheet, which will be used when you rerecord. You can find the QC sheet Audible Studios editors use here. 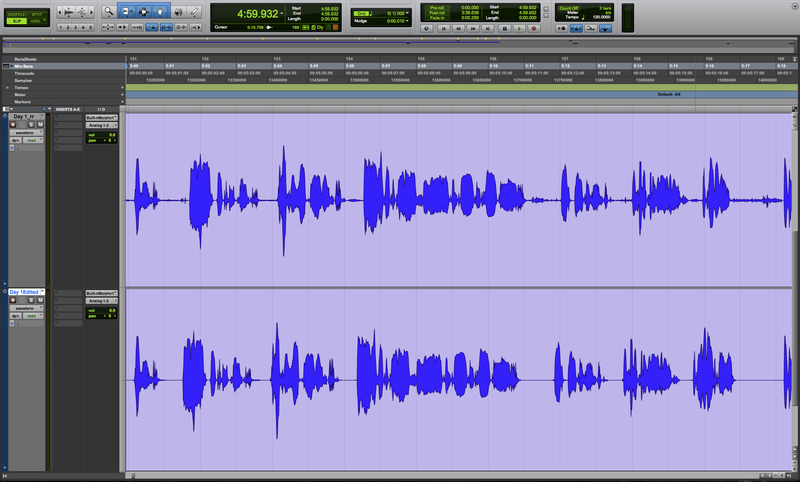 A Pro Tools session featuring unedited, or “raw,” audio on top and edited audio below. Audible Studios’ editors aim for a specific ratio of time spent on the edit or QC to the audiobook’s overall running time to ensure that these steps fall within the schedule and budget of the full production. When editing, the ratio should be 3:1, or three hours spent editing for every one hour of recorded time. For the QC process, the ratio should be 1.2:1, or 72 minutes of QC for every 60 minutes of recording. If you find yourself working faster than this, I recommend a second edit and QC pass to make sure you haven’t missed an error. If you’re consistently taking longer than recommended, you may be focusing too much on certain aspects of the edit. Try listening to some samples and reading reviews on Audible to learn what really bothers listeners. One way to stay within these guidelines is to speed up the playback in your DAW, so that you cover more ground than at the normal speed. While this may take some practice, it can help ensure that your editing is done quickly and correctly. If you go this route, I recommend you start at 1.2x speed, working your way up to 1.5x speed, as you get more comfortable. To learn even more about the editing process, watch this video from the experts at Audible Studios. Each uploaded file must have between 0.5 and 1 second of room tone at the head, and between 1 and 5 seconds of room tone at the tail. Why is this so important? Think of the spacing within your audiobook as the layout of words on pages and of pages within chapters of a print or eBook. Without proper spacing denoting the end of a scene or beginning of a new chapter, your listener could feel lost within the book, and the impact of your narration may be lessened. The easiest way to follow this requirement is to paste in the appropriate amount of clean room tone at the head and tail of each file. I hope this gives you a good understanding of one of the most important aspects of audiobook production. Check out my other posts for more audiobook production education, and come back soon for more tips straight from The Audio Scientist. Make sure you have clean room tone. If you don’t, you could be creating more problems than you’re solving. Record new room tone any time you change your microphone or studio settings. The old room tone may not match the sound of the new recording you are applying it to. Always wear headphones. You need to be in an isolated environment to ensure the narration stays natural and any cut is seamless. Get into the habit of marking everything. If you find a click, pop, noise, or QC error, make sure you mark the instance within your DAW! That way, when you go back to make the edits, you won’t have missed anything. Like what you read? Subscribe to the ACX blog to get updates every time we post! This entry was posted in Actors + Studio Pros and tagged ACX, audio scientist, audiobook creation, Audiobook Creation Exchange, audiobook editing, audiobook recording, audiobooks, make audiobooks. Bookmark the permalink. Some of us have been around long enough to have known the joys of reel to reel tape, razor blades and china markers (ahem,) but many of the folks narrating today don’t have the benefit of having engineers and/or directors and they’re reading directly off a computer screen. This creates some challenges for tracking, editing and identifying pick-ups down the road. It’s wise to have a second person present – with headphones – but outside the booth or closet during recording sessions for many reasons (like yelling, “I’m out of coffee!”) This person can track your mistakes for you – while you focus on the script. Using a paper script and doing mark up (red pen) is most efficient. Lately we’ve even tried using an ipad, a pdf version of the script and the ibooks highlight function to identify edits. Results have been a mixed bag. For folks doing everything themselves, (narrating, editing, fetching coffee) it is far more time consuming to try to edit by ear without an edit guide, however, the results are often just as good if not better than following an edit guide. Because you’re developing the overall production through critical listening for “the best take,” adjusting pacing and hearing the final product emerge, one sentence at a time. You’re also far less likely to be surprised by a missed edit in that final pass. Striving for time efficiency is a great goal but only if quality isn’t sacrificed along the way. Thanks, Alex! Could you answer a quick question for me as well? I use Audacity and have my leveler and normalize set so that my audio falls nicely within ACX’s guidelines. Having done that, do I actually NEED to compress as well, or do the level and normalize cover this? This article may be helpful for all the noobs who have never recorded or edited before. Otherwise, it is just common sense and seems like filler material. Kind of wish I hadn’t wasted my time reading this. It’s like, “In order to make grass grow, you must occasionally water it. To make grass look nice, you should pull weeds.” etc.